Enjoy a healthy Asian treat that you can easily make at home. This super-tasty shrimp summer rolls recipe is accompanied by a yummy peanut butter dipping sauce that’s out of this world! Prepping the ingredients is a little time consuming, but it’s so worth it! Succulent shrimpies, sparkling rice noodles, crisp cucumber, aromatic cilantro, mint and basil—it’s a perfect lunch, side dish or snack. The trick to perfectly wrapped summer rolls is to dip the rice paper in the water just long enough to get wet—about 1 second—then take special care to evenly distribute the ingredients. If you try to fit too much into your roll, the rice paper will tear. Once you’ve prepared your summer rolls, whip up the dipping sauce—it only takes a couple of minutes—then chow down! Place approximately 2 cups of rice stick noodles into a medium sized bowl then set aside. Bring 4 cups of water to a boil then pour boiling water over the rice noodles and allow them to sit in the hot water until softened to desired consistency. This will take anywhere from 5–10 minutes, depending on the thickness of the noodles. While the noodles soak, organize a tray of prepared fillings for the summer rolls. Cut the shrimp in half lengthwise and place on the tray. Julienne the carrot and cucumber thinly with a sharp knife or a mandolin—or, if you are lucky enough to have one, a julienne peeler. Pick leaves of cilantro, mint and basil from the stems, separate 8 lettuce leaves and arrange each ingredient in a separate stack on the platter. Drain rice noodles, running them under cool water as they drain to stop the cooking. Fill a bowl with hot tap water, which will be used for rice paper, then place all components within reach of your work area. You are now ready to assemble the rolls. Submerge 1 sheet of rice paper wrapper into the bowl of hot water for 1 second only. Allow the water to coat the paper entire paper evenly and allow the excess to drip off. Lay the wrapper flat onto your work surface—it will continue to soften as you add the filling. Place 4 shrimp halves in a row across the center of the wrapper, keeping at least a 2” border from the left and right edges. Add a few carrot and cucumber strands and a small handful of rice noodles. Sprinkle in the herbs and top with 1 lettuce leaf. Fold the left and right sides inward over the top of the filling, then tightly roll the wrapper—without breaking the rice paper—the same way you would roll a burrito. Once the rice paper touches itself, it will stick together and seal the roll. Repeat the rolling procedure with remaining ingredients. Once you have rolled all of your summer rolls, cover with a damp paper towel and place in the refrigerator until you have made the dipping sauce. In a small bowl, whisk together the hoisin and peanut butter until completely combined, then whisk in the rice vinegar, sesame oil, soy sauce and water. 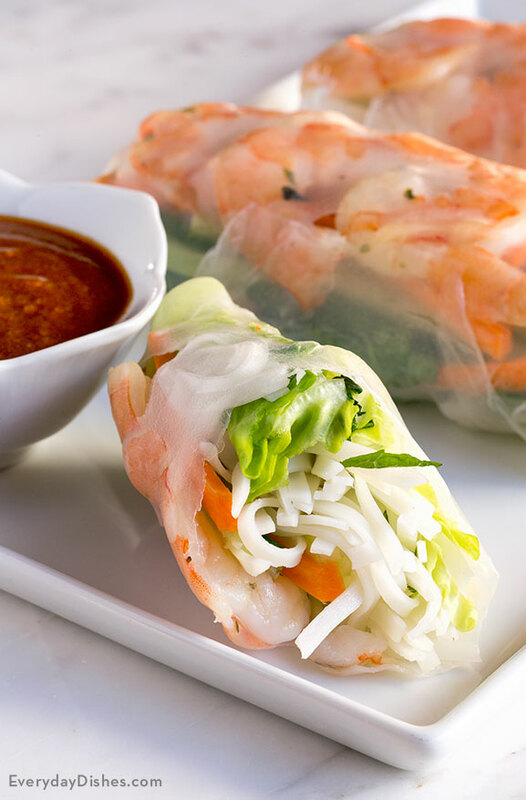 Serve the summer rolls with the dipping sauce and enjoy! The dipping sauce is flavorful, but it won’t overpower the ingredients in your summer rolls. Yum!